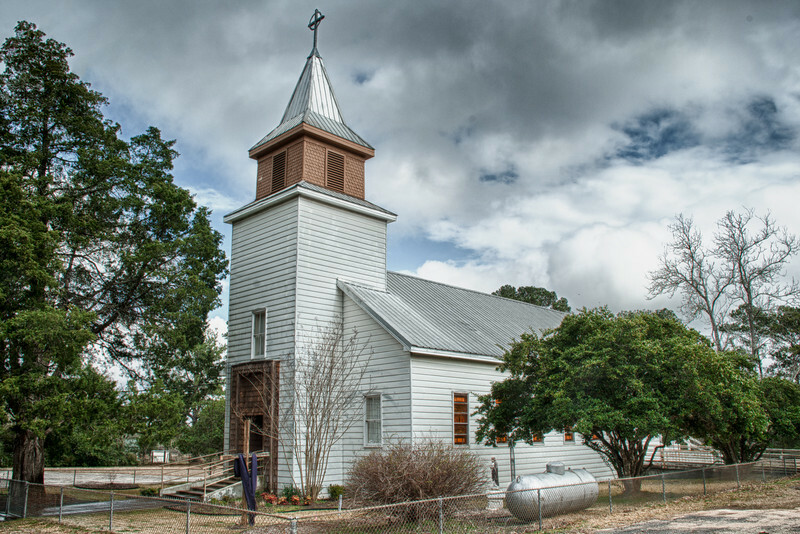 St. Joseph Catholic Church was established in 1909 by a group of Polish-speaking immigrants from the Grimes Prairie, Stoneham and Plantersville areas. For many years, Stoneham’s Polish community worshiped either with the Polish community of St. Stanislaus in Anderson or with the Ukrainian-German community of St. Mary in Plantersville. In 1909, because of historical rivalries and antagonism rooted in the Old World and the arrival of a new pastor at St. Mary, the Polish community in the Stoneham area separated itself from the Plantersville community, joining itself with the Polish community of Anderson as a mission, and built its own sanctuary in the present location, under the spiritual leadership and jurisdiction of the Polish-speaking pastor of St. Stanislaus in Anderson. This arrangement would last until 1967 when jurisdiction would be transferred to St. Mary in Plantersville with St. Joseph as its Mission. This is the present status, uniting the communities of St. Mary and St. Joseph. The land for the present location was purchased from Mrs. J.O. Stoneham. It was a ten acre tract just south of Stoneham, which was then a small, thriving community. The parishioners united and built a church of modified New England style prevalent and popular at the time, large enough to accommodate the growing Polish population migrating into the area. A small rectory was also built near the new church for a visiting priest to stay the night. Unfortunately, St. Joseph was never fortunate to have a resident pastor. On July 19, 1909, the present property was, of course, deeded to the Right Rev. Nicholas Gallagher, Bishop of Galveston, which, at that time, comprised the entire State of Texas. Traveling to Stoneham, Bishop Gallagher dedicated the newly constructed church in 1910, with Fr. Markus Dombrowski of St. Stanislaus in Anderson as its first pastor and established it as a mission of Anderson. The cemetery was also established at this time. Records show that the first wedding celebrated was that of Tony Sechelski and Agnes Niscovits in 1910 and the first burial in the cemetery that of Michalena Filipak (Phillips) on May 13, 1910. During this period, Fr. Dombrowski [1910-1911] was succeeded by Fr. C.H. Wiesnerowski [1911-1912]. Fr. J.B. Gleissner [1912-1920], the pastor of St. Mary in Plantersville, also took time to take care of the spiritual needs of the faithful at St. Joseph. The celebration of Holy Mass was sporadic, with the congregation called together when the priest arrived. Baptisms and weddings were celebrated and recorded in the church of Anderson. Finally, in 1920, with the arrival of Fr. N.T. Domanski [1920-1955] as pastor of St. Stanislaus, a regular celebration of Holy Mass once a month was implemented. The sermon was given first in Polish and repeated in English, a common practice in many immigrant communities. Only after the children of these first arrivals started school and became fluent in English, did the parents begin to understand and speak the language of this country. The situation was the same in the community of St. Mary, with a German-speaking pastor and congregation. The language barrier and cultural differences would divide the two communities only six-and-a-half miles apart. The link between St. Stanislaus/Anderson and St. Joseph/Stoneham would last until 1962. Fr. T.W. Kappe [1955-1960] was the last pastor of St. Stanislaus assigned to care for the faithful of St. Joseph. When Fr. Kappe died on January 16, 1976, he requested that he be buried at St. Joseph under the large cross in the cemetery. He is at the present the only priest whose body lies at St. Joseph Cemetery awaiting the Resurrection on the Last Day. In 1962, when Fr. Tom Wendland [1962-1967] was assigned as pastor of St. Mary in Plantersville, the Mission of St. Joseph was transferred to its care. This is an indication that the original language and cultural differences were healing, with both communities becoming truly American. In 1967, Fr. Leroy Braden succeeded Fr. Wendland and initiated a complete renovation of the interior of St. Joseph. This was typical of the times following Vatican Council II [1960-1965] when many traditional church sanctuaries were renovated to accommodate the new Liturgy. Renovation was welcomed by the parishioners because the church was in great need of repair and strongly advocated by the pastor. Unfortunately, as in many cases of such renovation, little care was taken of the history of the church and linking the old with the new. As a result, the Main Altar, which in the old photographs seems to be a hand-made, Texas primitive Altar, was removed and burned. The side altars were also placed on the burn pile. Thanks to the heroic action of Mrs. Helen Mock, one side altar was saved and is now seen on the right side of the sanctuary near the Baptismal font. The Statue of St. Joseph was retained in the newly renovated church and placed on a high pedestal where the Main Altar once stood. The other statues were in storage, with plans to eventually bury them, which is the practice for unused/unwanted religious items. Again, thanks to the heroic thoughtfulness of two parishioners, Mrs. Laura Sechelski and Mrs. Sechelski Nowak, the statues were rescued from such a fate and respectfully and devotedly kept in their homes until they graciously returned them when the restoration of the church was undertaken in 2001. Mrs. Sechelski and her family enjoyed the presence of the Sacred Heart and the Blessed Mother. Mrs. Nowak and her family awakened to the image of the Risen Christ. A promise has been made to the families that should any future renovation of the church be considered, the statues would be returned. In the 1968 renovation, the windows in the Sanctuary, the choir loft and those on either side of the front doors were eliminated and covered over. The ceilings were lowered with acoustical tiles, with the air-conditioning/heating system running the length of the side aisles and fluorescent lighting added. A walnut-color paneling was installed over the beaded board throughout the church, giving it a rather dark character. Contemporary furnishings replaced the old. The Stations of the Cross were replaced with a very contemporary design. The Paschal Candle stand is now the only article of liturgical use that remains of the 1968 renovation, being in memory of the Busa Family. The original windows of the church were clear glass. In time, an amber class was installed, which can still be seen in the side sacristies. In the early 1990’s, Fr. Eugene J. Gillece [1987-1993], working with the parishioners, contracted for the present leaded windows. They depict the Joyful, Sorrowful and Glorious Mysteries of the Holy Rosary, beginning with the left window of the front door and following the left side of the church to the right. The 16 th window in the right front door is in honor of St. Joseph. They are made by a Texas firm and are of a simple, contemporary, yet traditional flavor that blends with the restoration of the church. The Altar of Sacrifice [the altar on which the priest celebrates Mass today] was made by Mr. Steve Buryzynski and his sons. It is a simple design and has been in continuous use since 1968. The vesting cabinets in the priest’s sacristy [on the right of the sanctuary] are original to the 1909 church and are of a Texas primitive design. The large chest in the foot of the stairs is also original to the 1909 church and in its original place. It stored candles and other items. It was saved and returned during the restoration by Mr. Charlie Buryzynski. The Holy Water font at in the foyer is also original to the 1909 church and was found in the field behind the church. It was saved and mounted in its present location by the Joe Imhoff family in memory of his parents. The pews in the nave of the church were probably donated or purchased at a later date, though two, hand-made pews in the choir loft are thought to be original to the 1909 church. The Victorious Lamb over the side altar to the right is also original, as is the box containing the Holy Oils. The Infant of Prague is of a newer date, the original statue unfortunately lost. The Holy Water stand at the side entrance is also original. The candlesticks on the Back Altar are typical of the period and thought to be original to the 1909 church.